Heirlooms Reunited: Calling Card of Noah C. Currier, presumably Noah C. Currier born at Chesterville, Maine, in 1864. 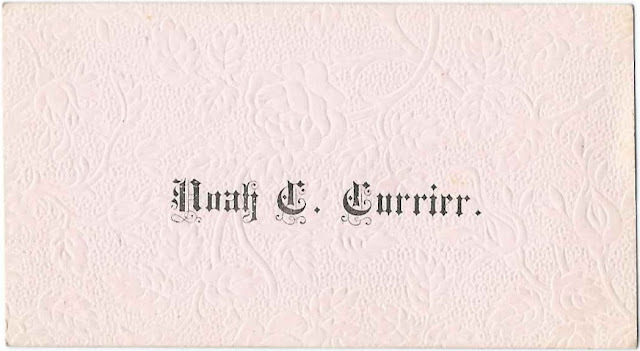 Calling Card of Noah C. Currier, presumably Noah C. Currier born at Chesterville, Maine, in 1864. Calling card of Noah C. Currier, presumably Noah C. Currier of Franklin County, Maine, since this card was found with others from Franklin and Somerset Counties in Maine. Noah's middle name may have been Carlisle. Noah C. Currier was born August 12, 1864 at Chesterville, Maine, the son of Levi Prescott Currier and Julia Alice Eliza (Smith) Currier. Found with this card is one bearing the name of Lettie O. Morse, who was presumably Letitia Octavia Morse, future wife of Noah's brother Albertus Earl Currier. November 11, 1893 at West Farmington, Maine: Loretie/Loreda/Loredis/Loveda/Lovetie E. Curtis, daughter of Frank Curtis and Mary (Randall) Curtis or Abigail Moses (Randall) Curtis. Noah and Loreda had two children before divorcing. October 2, 1908 at Farmington, Maine: Josephine Anna (Gould) Cooley, daughter of Frank A. Gould and Sarah (Fish) Gould. Josephine was divorced from her second husband, if not both. Her husbands were Ezra Alton Blake, with whom she had several children, and Laforest W. Cooley. Noah died in 1933 and is buried in the Franklin Cemetery at Vienna, Maine, with Currier relatives. Although I haven't verified it, an online source mentions that Josephine is buried in the Lexington Flat Cemetery at Lexington, Maine, with her first husband Ezra A. Blake.